Float to victory or swim to shore! in boats made of nothing but cardboard and tape! 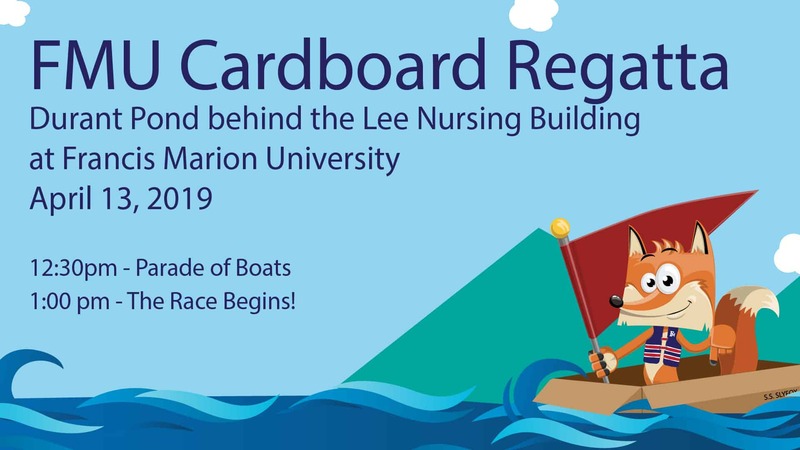 FMU’s Cardboard Boat Regatta will be held at Durant Pond on the university’s campus in Durant Park, directly behind the Lee Nursing Building on Saturday, April 13, 2019. The day will begin with Parade of Boats down Alumni Drive at 12:30 p.m., with races beginning at 1 p.m.
All FMU students in good standing — both academically and disciplinary — are eligible. Applicants will be asked to supply their g.fmarion email address as part of the registration process. Teams are free to select their own team names and create team apparel, subject to approval by the organizing committee. Both Individual and Team Registrations will close on April 1st, 2019. 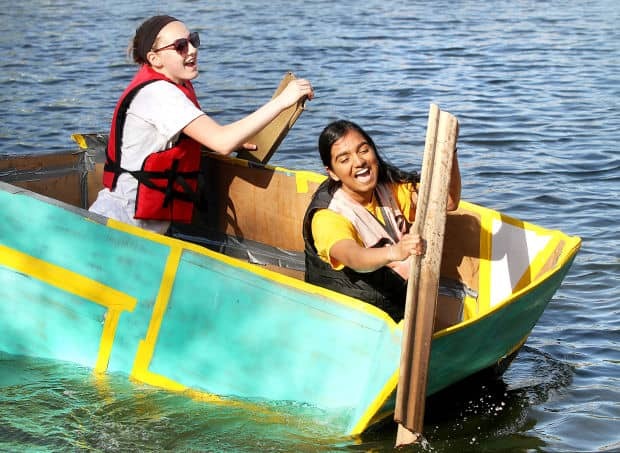 Large sheets of cardboard (think refrigerator boxes) and Rolls of Duct Tape will be provided for Teams to use to construct their Boats. Other items such as paint, or decorations are up to the teams to provide. Starting Friday April 5 Cardboard and Tape will be available in the University Center (UC) for Teams to use. The Tape can be checked out at the UC Desk. The Cardboard will be in housed in Racquetball Court #4 in the rear of the U.C. 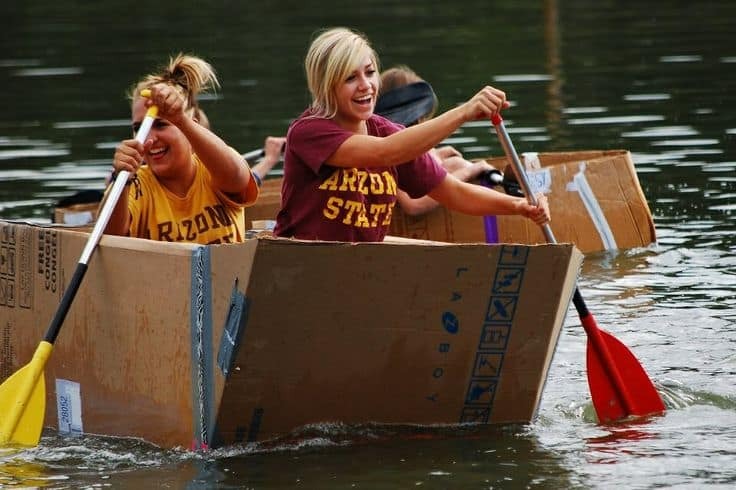 Student groups can build their Boats in Court #4 and leave them overnight. The materials and the Racquetball Court will be available to the students up until 10:00am on Race Day, when the Boats are required to be placed on the front steps of the UC for the public and judges to see. 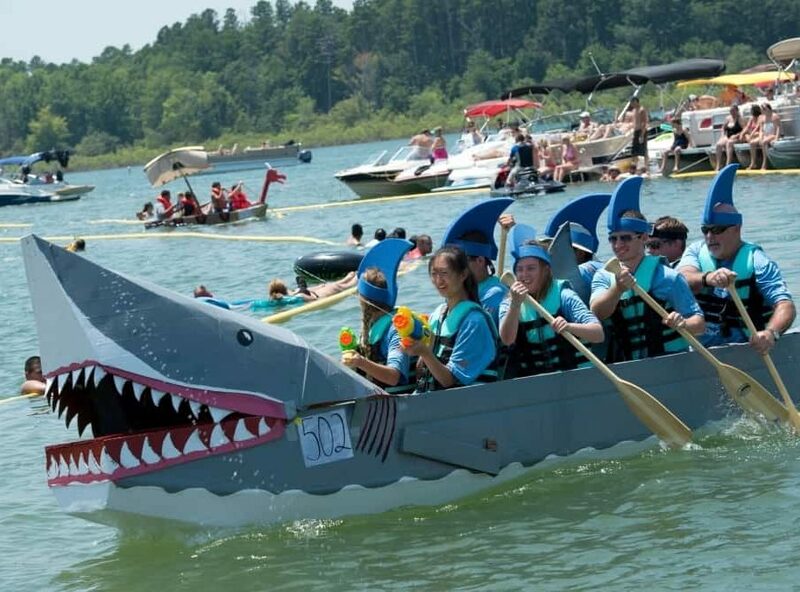 At 12:30 assemble your team, as you will have to carry your boats via the Parade of Boats to the Lake for the Race. 1. Only corrugated cardboard may be used. It can be of any thickness. 2.No material such as Styrofoam or rubber inflation devices may be used to provide “buoyancy” or maintain flotation. Violators will be branded “Pirates” and stripped of any trophies. 3. The Boats may be painted (this is encouraged to be more creative). 4. For environmental reasons, Hulls my not be coated in tar, oil-based paints, vinyl, Plastic coating, shrink wrap, or fiberglass resin. 5. Joints and seams may be glued and/or taped. Duct tape, contact cement, rubber cement, or construction adhesive may be used. 6. No nails or metal or wood fasteners or staples may be used in the construction of the boat (However above the water line small amounts may be used for decoration only). 8. Decorations may be made from any material but may not be used to reinforce the actual structure of the boat. That also must not aid in the flotation or propulsion of the boat and do not create a fire or safety hazard. 9. 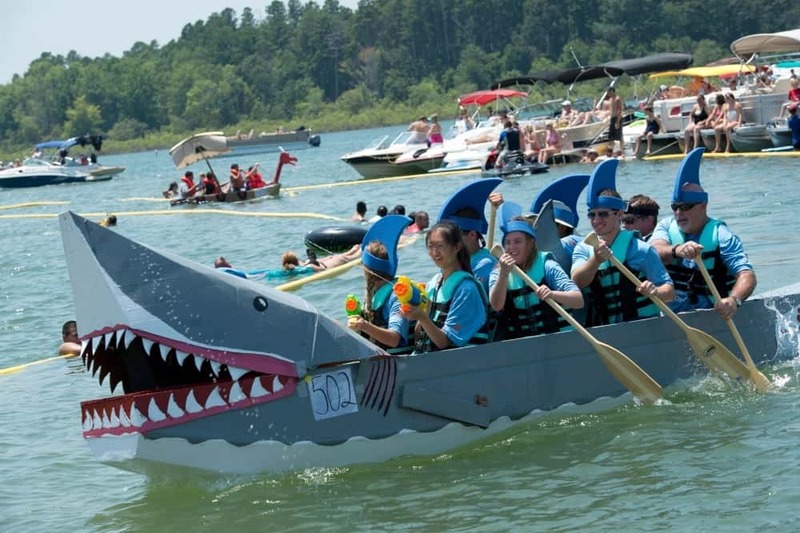 All Boats need to be able to be carried in the Parade of Boats prior to the race and from the Judging area to the designated starting bank at Durant Pond. Keep it light, or have many Teammates to assist! 10. Boat design is left to the builders. 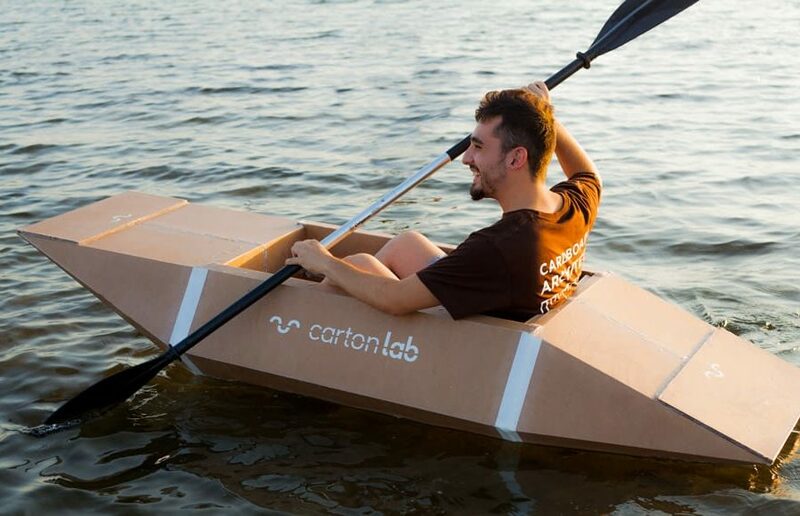 Let your imagination take over; make your boat look like a race car, flying saucer, dragon, etc. Crew costumes are encouraged. **Note** Boats are subject to inspection and disqualification by Race Officials. 1. Teams may be of any number (the more the merrier). All Teams must be officially registered by April 1st, 2019. 2. Only 1 chosen “Captain” can sail in the race. 4. No boat will be allowed to leave the starting gate unless all persons on board are wearing a personal flotation device (life vest) as well as hard soled, close toed shoes. 5. 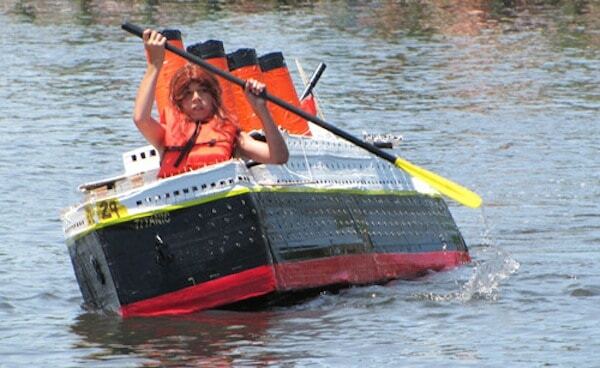 Up to 2 teammates who are not in the boat may help push the boat away from the starting line. 6. All Teams must ensure that their area has been cleaned prior to departure on Regatta day. All boats and materials must be removed from the site or cut apart and placed in available trash containers. 1. The course will entail on “out and back” circuit from the marked stating bank around the designated fountain in Durant Pond and back to the starting bank. 2. Contestants may choose their path to circle the fountain and how close to the fountain they wish to travel in their out an back heat. 3. Dependent upon the number of entries, there will be Heats of Four Boats completing the course circuit at any one time. 4. Boat Captains may not intentionally ram another boat, or cause harm or sinkage due to intentionally splashing another boat, throwing water balloons, etc. 5. All remaining Boats (still capable after their heats) are invited to compete in the final race of the day… The Pirate’s Race! All Boats need to be in the judging area in front of the University Center by 10 a.m.